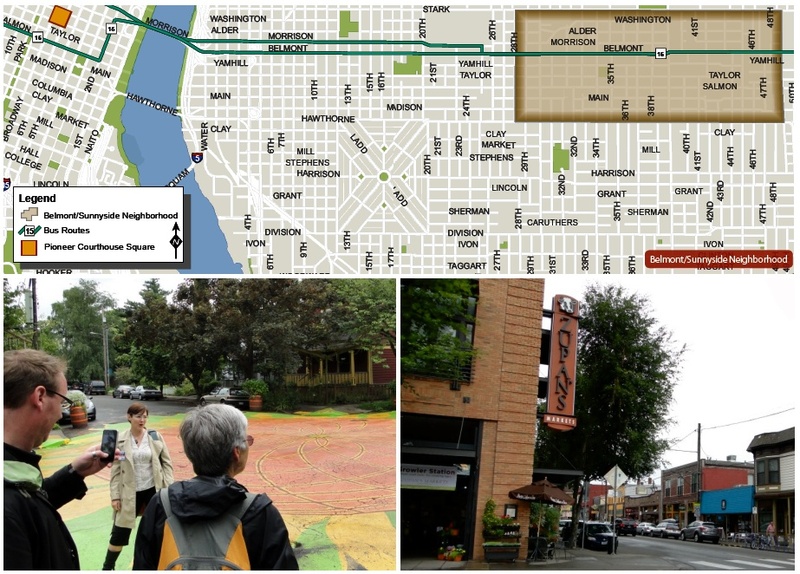 I arrived in Portland a couple of weeks ago to attend the International Making Cities Livable (IMCL) conference -- and learn a little about Portland, Oregon. But how to start understanding this diverse, growing city, with a national -- even international -- reputation for progressive planning and land development practices? 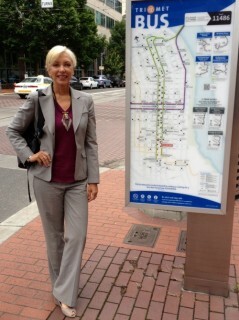 Our guide from First Stop Portland, Sarah Iannarone. Fortunately, IMCL offered some introductory pre-conference tours. And that's how I was introduced to First Stop Portland. You see, Sarah Iannarone, our tour guide, is Assistant Program Director for First Stop Portland, a non-profit that's housed at Portland State University. Iannarone's a neighborhood activist, the owner of a small neighborhood business (the Arleta Library Bakery Cafe), and a doctoral candidate in urban studies and planning at PSU -- and that's when she's not working part-time for First Stop Portland. 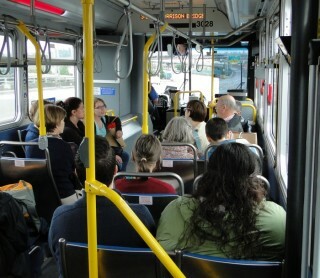 Participants from International Making Cities Livable conference heading out to Belmont/Sunnyside Neighborhood. Iannarone took a dozen of us on a fascinating afternoon tour of the Belmont/Sunnyside neighborhood, just a couple of miles from downtown Portland across the Willamette River. Of course, no tour bus for our group -- we hopped on a regular city bus to reach our starting point. Iannarone's focus was on explaining how the City's "20 Minute Neighborhood" concept works -- as we walked through the Belmont/Sunnyside neighborhood. 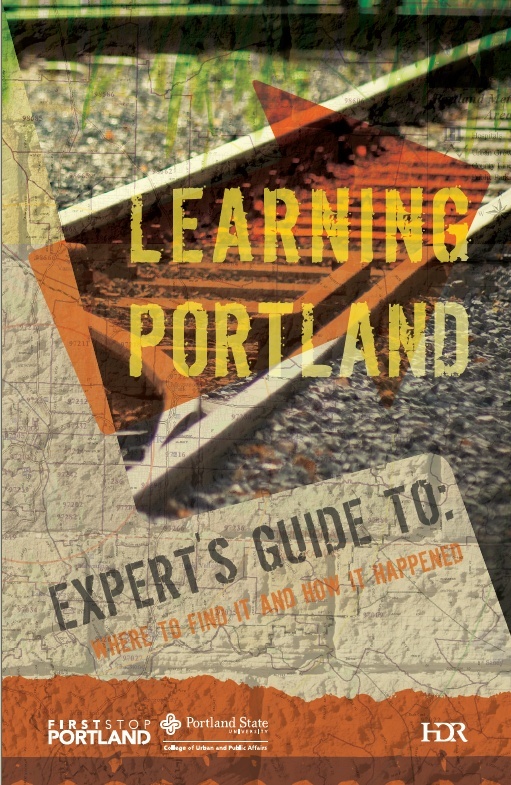 Map is from First Stop Portland's "Learning Portland" guide; more on this later. The photo above left is of the painted circle in one of the dozens of "intersection repair" projects in Portland. I'll be discussing this program in a coming post. Above right, part of the neighborhood's commercial hub, anchored by a mixed-use project -- including Zupan's grocery store visible on the left side of the photo. 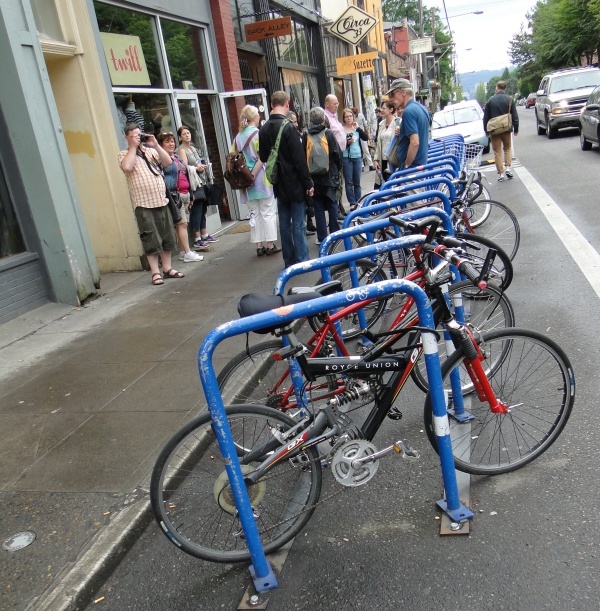 Below left, our group takes a look at one of many bike stations along Portland's commercial thoroughfares. Click on images to view at larger size. I'll have much more on the 20 minute concept in my next post. 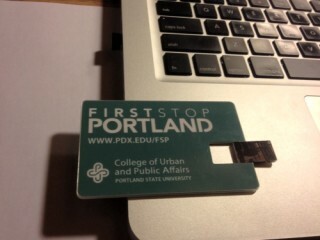 But right now, I want to tell you about First Stop Portland, since it's a quite creative and intriguing program. So, just what is First Stop Portland? To find out more, I met a few days later over lunch with Nancy Hales, the program's director. Hales is now in her fifth year living in Portland. While she's an economist by training, she started her career as a community organizer (yes, the same early career path followed by our President) working for VISTA in Yakima, Washington. Hales then spent 15 years as a group leader and trainer for the U.S. Forest Service, working with the young adult conservation corps. Following other jobs and stints as a volunteer -- and with her children now grown and out of the house -- she found her perfect match in helping set up First Stop Portland. Here's what led to First Stop Portland, as Hales explains. City planning officials, the mayor's office, and the large and growing "green brain trust" sector of Portland (including planners, architects, engineers, and others) were being barraged with requests for their time from people visiting Portland who wanted to learn more about the city's reputation as a hub for green ideas and technologies. They asked Portland State University to design a program to handle incoming requests from people interested in visiting. The business community kicked in some funds (and have continued to contribute about $30,000 a year); Metro, the regional governing agency, put in $15,000 (again, annually), and PSU provided office space. Hales was hired as Director. How to design a program to deal with visiting officials, planners, and other experts? "We looked at some existing models ... for example, Amsterdam has a standard one week urban planning program for visiting planners; but we wanted something customizable." And that's the way the program works. "We develop a customized program for each 'incoming delegation' " (as Hales terms the visitors). "We spend a lot of time in advance researching their interests and finding out who will be in their delegation." The goal is to maximize what they get out of their visit to Portland. 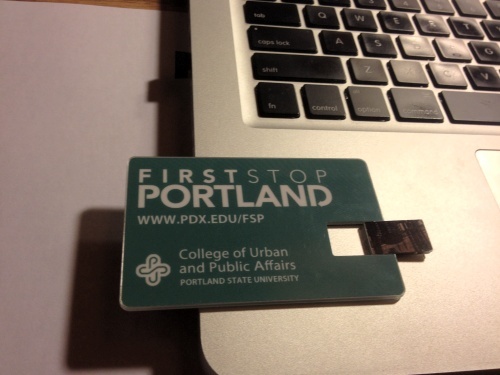 How do visitors get hooked up with First Stop Portland? "Mostly, we get referrals from the Mayors office, the Planning Bureau, or Metro," says Hales, "but now many have heard of us and contact us directly." "Inbound delegations love the fact we're part of the University, and act as a neutral, objective broker. We show them the city, warts and all." And, she added with a smile, "That's not something they'd necessarily get if tours were organized by, say, staff from the mayor's office." 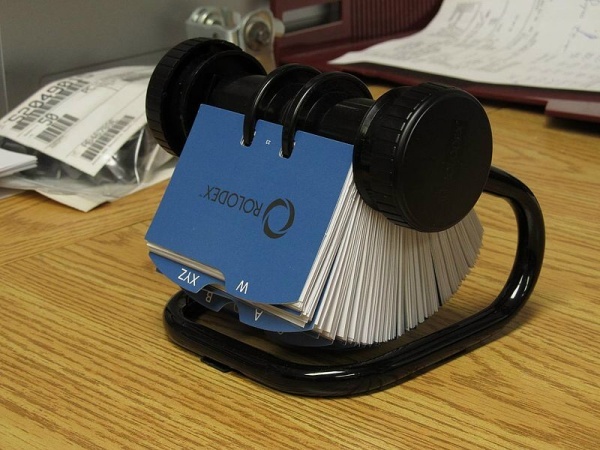 Hales didn't lug her Rolodex to our meeting; so for readers not familiar with an actual Rolodex, here's an example (from Wikipedia). Hales relies on an old-fashioned method when planning each incoming delegation's stay. As she noted with another grin, "I have the best Rolodex in the world." 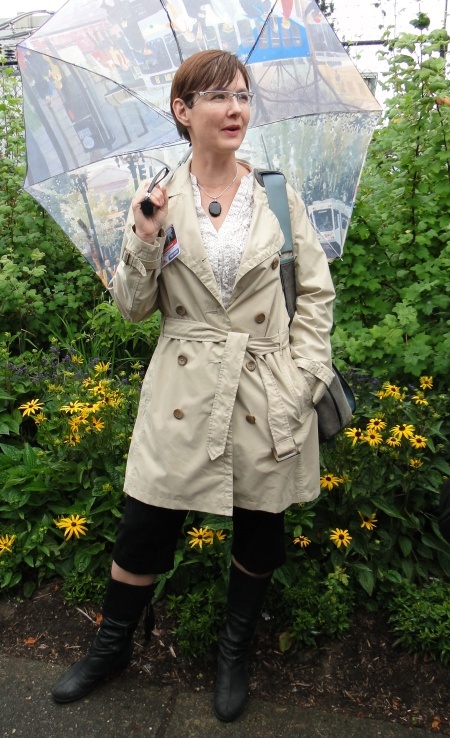 She uses her Rolodex for contacting local planners, designers, architects, engineers, and public officials to help out with particular tours, or to meet for discussions with an incoming delegation. First Stop Portland has a paid staff of just two (Nancy and Sarah), but makes use of student volunteers from PSU. Nancy also teaches a practicum called "Presenting Place," whose students often help with First Stop. Who's First Stop Portland hosting? Quite varied groups, Hales explains, but with a common interest in learning how Portland has implemented a range of "green" practices -- storm water and environmental practices; transit-oriented development; urban design; and a range of sustainable development issues. First Stop Portland has prepared an excellent guide to Portland, with information about many of the city's environmental and planning policies. It's included in the flash drive members of every visiting delegation receive. About two-thirds of delegates are from other U.S. cities, the balance from overseas. "Usually they arrive wanting to see how the Portland area addresses a particular issue they're facing back at home," Hales explains. "For example, how do you become more of a "green" city; what strategies work best to reduce carbon emissions (a frequent theme now); how do you best implement transit." "A lot of interest is coming from rapidly developing, urbanizing cities," she adds. Average delegation size is about eleven people, but some groups are considerably larger. Last year, according to Hales, First Stop Portland hosted somewhere between 350 and 400 delegates -- on average about one delegation per week. Depending on the group's interest, tours also often go out to several of Portland's booming suburbs, such as Gresham, Beaverton, and Hillsboro. [Editor's note: I'll have more on Hillsboro in a coming post]. The two videos below will give you a better feel for First Stop Portland. 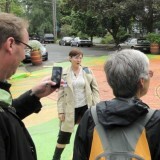 The first is First Stop's introductory video; the second gives a sense of the kind of meetings a delegation might have during their stay in Portland. Delegations are requested to cover a portion of First Stop Portland's costs; about $120 per person for a full day of touring and meetings. Back in Burlington, Vermont, I'm downloading material about Portland from the flash drive Nancy Hales gave me. Every delegation goes home with a flash drive with everyone's contact information, plus other material, including a terrific booklet, Learning from Portland. [And yes, Hales had a flash drive for me]. "To start with, the city doesn't have to scramble and provide staff for visiting delegations." But more importantly, as she stressed to me, Portland businesses benefit -- as delegations go away having made connections with Portland business and professional leaders. "A lot of high level visitors looking for knowledge exchange." This, Hales notes, has led to jobs for Portland area businesses, as the delegates remember that "we build green cities" and leave having made local contacts here. What's in store for Hales? She may be switching to part-time soon, as her duties due to her husband Charlie's new job have become more time-consuming. Oh, did I forget to mention that Charlie Hales is Portland's newly elected Mayor? -- and that I didn't realize this till half-way through my lunch with Nancy. I need to get a rolodex!